I did find lights, actually. But they aren’t a string, oddly enough. They come in a loop so you can line them perfectly around your window. Fitting them around a very tiny, very plastic tree is more of a challenge. I also don’t have ornaments, so I’ve been using earrings and keychains to decorate my little stromeček. My room is pretty void of anything Christmasy, save the tree and a collection of Christmas cards from some of my students. There is also a pretty glorious mound of tissues which allude to Jack Frost’s rather invasive steps into my health and well-being. The music has been coming along in leaps and bounds, though. My Christmas playlist now has 30 songs – some in English and some in Czech, and one sung in English by a Czech. I can never get through “Have Yourself a Merry Little Christmas” without crying – this must be a sign of the times because I hated that song as a kid but I can’t get past, “Through the years we all will be together” before I choke up. I distinctly remember one Thanksgiving when I was about fourteen, looking myself in the mirror of my grandma’s bathroom and thinking, “So this is how Christmas feels as an adult?” Gone was the excitement, gone the anticipation, gone the thrill of decorating the tree and awaiting presents (although the gift list was still very much present and growing). As my happy childhood was replaced by teenage years (which were also happy, though shaded with angst and a two-year period of pseudo-emo taste in music), Christmas just didn’t seem the same. That year I also began listening to Faith Hill’s “Where are you Christmas?” in one of my most self-absorbed, “let’s make EVERYONE miserable” moves ever. If you don’t hate Christmas already, trying listening to that song on repeat for three weeks. I’ve started watching Christmas movies to “get into the mood.” It’s not been super helpful. Even Christmas shopping hasn’t been fun. I almost burst into tears over a sweater in some department store today for no explicable, rational reason at all. Some guy gave me a weird look and I left the store. Grinches, all of us. Finally, the other night, I turned on The Nativity while I finished crocheting a hat for a friend (because making Christmas gifts is the only cheap way to look like you still care). I was struck by how real the Christmas story became. Not that I haven’t heard it, read it or sang it a thousand times. But watching it… Seeing the fear and the faith of Mary and Joseph, the pilgrimage of the Magi to meet the King of Kings, the wonder and awe of the shepherds. After blowing my nose and wiping my eyes (Whaaaat? Mary didn’t cry again did she?? ), I sat back and looked at my dinky little Christmas tree. I hadn’t even turned the lights on that evening and it has been starless since its purchase. We make all these grand metaphors for Christmas. The star on the tree was the one that led the wise men, the tree is a symbol of the cross, the presents are like the gifts of the Magi or the gift Christ gave us or whatever we tell ourselves. But when you’re on the other side of the world and your youtube playlist won’t play because the internet only works if you’re sitting on the floor by the wardrobe, all it looks like is a scrawny, plastic tree with cheap lights. There is no silent night. There is no hushed sense of peace and joy. And Christmas becomes an over-hyped day on the calendar like Valentines – nice enough for people who have someone to give a card to or eat dinner with, miserable for those of us without. Several friends have tried to comfort me with the reminder that my precious, perfect, dearly-beloved sister (who I haven’t seen in a year) is flying all the way across the pond to make sure I’m not alone on the big day. I stared at my Christmas tree, choking down a Halls cough drop before bed to curb a coughing fit (all out of NyQuil because God is really trying to sanctify me this month). 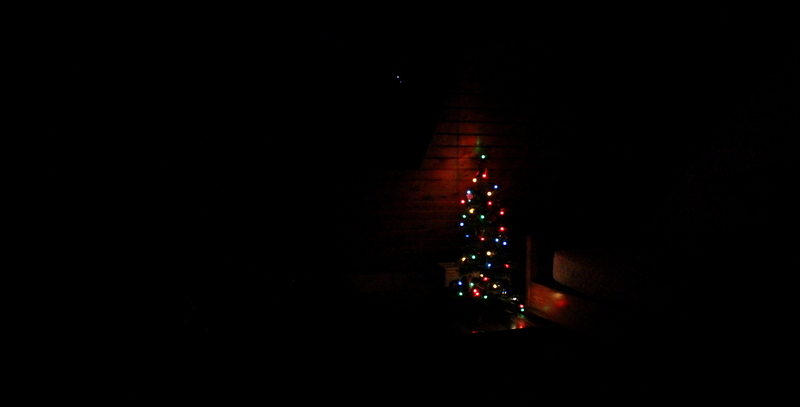 My stupid little tree was the only light in the room. I guess it was kinda pretty. No sleep till the cough drop is gone, so I did some soul-searching and some compartmentalizing (“This is what separates men from women,” my brother always tells me. “Men compartmentalize.”). My list of worries is long. My plans, my expectations, my wants – my “adult” Christmas wish list, you could say. The things that don’t come in a sleigh or with a bow. ‘My,’ ‘my,’ ‘my,’ all about me. I was just like 14-year old Mary, worried that Christmas wouldn’t be any fun without presents. This life is not my own. It is a gift I don’t deserve. And who knows the winding paths of my future better than the author of my life? Why do I always worry? Maybe it was the flickering of my cheap Christmas lights or the fact that my glasses had fallen behind my desk so everything looked fuzzy, but suddenly the skylight seemed like a telescope into the roving depths of the universe. And deep in the blackness, infinities away, God was still moving and shaping, Himself unchanging. I felt like a little girl in a snowglobe, but instead of the jolly face of Santa Claus peering down at me, it was the eyes of an all-knowing, all-loving Creator. Do you know what it’s like to feel small? I do. Why then, for such a small, pathetic, incurably worried little girl, would God send his one and only Son – also fully God – to this small, pathetic, incurably worrisome little world. And not in chariots or limousines. He sent him to a small, pathetic stable to be born to small people, to live a human life of pain and sadness. The King of Kings. The Lord of Lords. The Maker of the Universe. The Face on the other side of the snow globe. He died. And through that death, he redeemed us so that we might not be small, but large. And not large for ourselves, but for the glory of our God and Father. His gift is not a peace on earth like we want – not an end to all wars. His gift is not a joy like we want – our every wish fulfilled. His gift is that through his death we have been freed from sin, we have been made to see the love of God that we were once blinded to. That through his death we have a peace in our hearts that transcends understanding and reason. That through his death we have a hope that God works all things for the good of those who love Him. That through his death we have a joy untarnished by loss and loneliness. I still don’t feel very Christmasy. Maybe next year “All our problems will be far away.” But while the rest of the world relishes one night of “peace on earth” I will rest in a peace eternal, and thank God for the gift of His Son. This entry was tagged change, Christ, Christmas, expat, God, hope, joy, life, peace, Prauge, Santa Claus, snowglobes. Bookmark the permalink. Hi Mary. Thank you for sharing those beautiful thoughts. As I was reading I was reminded of a quote I heard the other day,”We understand Christmas at Easter”.